Taken from Handmade in the UK: "An estuary is an in-between place, not ocean, yet no longer river. It is a fertile habitat where sweet and salt water mix,and many species thrive. 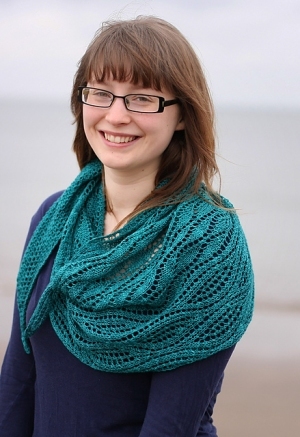 Estuary combines two lace patterns to create an ambiguous shape: not quite a shawl, yet something more than a scarf." This pattern is from Handmade in the UK, pg 28 - Estuary. Finished Measurements: 16" x 76" after blocking.